Eat, play, or work in cushy comfort on sofas and upholstered chairs with this elegantly designed lap desk. Calling all couch potatoes: Free yourselves from confining tables! Eat, play, or work anywhere you like, with this well-designed personal table resting on your lap. It's more stable and comfortable than beanbag lap trays. Looks-wise, there's no comparison: this one is truly elegant. 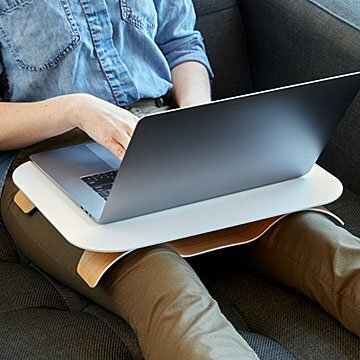 As an ergonomic laptop desk, it enables you to sit on a comfy chair and do serious work or play video games for hours, while protecting your thighs from the CPU's heat. Those ultra-sleek and smooth devices stay put with the included non-slip silicone pieces, which also protect the tray from scratches. A quick wipe takes care of cleaning. #SofaLife has never been so sleek. Charles Plassard is a designer based out of Bievres, France. He has been designing products for 15 years and started with an electric folding bike. He designed the kneestation tray for himself and used it everyday for eating and working so he decided to bring it to production. This lap desk is flimsy, and of poor quality. The magnets that hold the top to the knee rest come out and if you pick the top up with a laptop on to, it come apart. I am returning the item. Very disappointed, I paid for expedited delivery, and now I am back to shopping for my husband's birthday present.